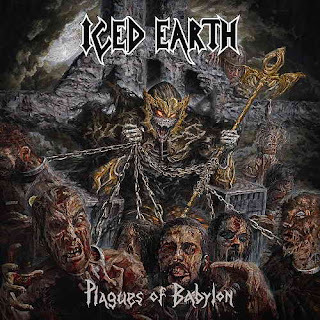 A cold and snowy February calls for me to review Iced Earth once again! This time, I am taking a long-overdue look at the dawn of the Stu Block era. Stu Block had been the vocalist for Into Eternity prior to joining Iced Earth in 2011 to replace long-time singer Matt Barlow. From all I have read on Barlow's departure, between the official Iced Earth website, facebook page, and wikipedia articles on the issue, his departure from the band was amicable and seemed to be an honest retirement. 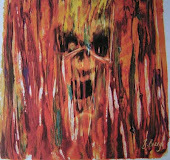 (Barlow has since started a band called Ashes of Ares). Stu Block stepped in and provided a voice for their 2011 album, Dystopia. As a long-time Iced Earth fan, I was naturally hesitant about another change of the vocalist role, but Stu's amazing range and stylistic emulation of Barlow's tone, and grit immediately put me at ease, and in the end the Dystopia album won me over completely. While the title track 'Dystopia' thrashes along with the best Iced Earth classics, I cannot help be notice the uncanny, seamless transitions from deep growls to high falsettos that Block displays throughout the song. At some point this talent surpasses simple emulation of Barlow's vocal style, and approaches a 'King-Diamond-esque' mastery of range. 'Anthem' is the next track, and the clean guitar intro which transitions to a low-tempo, minor-key riff shows the listener that Iced Earth will again have all their talents on display for this album. The lyrics are a social criticism with a call for resilience among society's downtrodden classes. The plight of the homeless and poverty-stricken are present throughout. Never a band to shy away from social or political issues, it is clear that Iced Earth are also out to make some statements on this album. 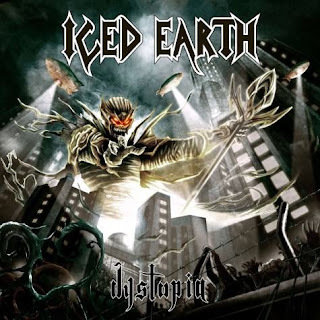 Iced Earth show you their full repertoire on Dystopia, with songs that push the upper limits of intensity like 'Boiling Point' and 'Days of Rage', but balanced out by softer and slower tracks like 'Anguish of Youth' and 'End of Innocence'. Not only are the riffs impressive, but the lead guitar solos are better on this album than the past several Iced Earth albums. Plagues of Babylon picked up where Dystopia left off. Another concept album, this one actually makes some lyrical references to concepts explored on the Something Wicked, 2-part album. This album opens with a slow and ominous drum beat. Again, this serves as a build-up to the actual song, 'Plagues of Babylon', which shortly morphs into the classic Iced Earth thrasher-type of song. Stu Block's versatile vocals are on display from the get-go. Block's deep growl is in constant contrast with his upper-range screams and mid-range melodic voice, which simultaneously surprises listeners with unexpected twists and serves the needs of each given song and just the right moments. As I mentioned before, he fits perfectly as a replacement of Matt Barlow, yet also draws comparisons to Tim Owens and even the legendary King Diamond. 'The Culling' is one of the songs that seems like a direct continuation of the concepts from the Something Wicked albums. Mainly a mid-tempo grinder of a song, it also contains a breakdown segment and an impressive guitar solo. 'If I Could See You' is a sad and touching Iced Earth ballad of loss. In much the same way as 'Watching Over Me' primarily featured clean guitar melodies and a minor key tone to convey the emotions of loss and grieving, this song displays the softer side of Iced Earth and is more about losing an inspiring role model than a friend or lover. The Highwayman is a cover of the Jimmy Webb song made famous by the country super-group The Highwaymen. Here, in similar fashion, Iced Earth performs it as a quartet with different verses sang by Jon Schaffer, Stu Block and guest vocals by Volbeat's Michael Poulsen and Symphony X's Russell Allen. The presence of such big names in the current metal scene make this the best collaboration of talent in the genre since the Big Four of thrash metal performed the song 'Am I Evil?' together on stage in Sofia, Bulgaria.